TREAT software has passed CalTEST and can now be used in the Energy Upgrade California® Home Upgrade Program!! Contractors in California can now use one of the most accurate modeling tools in the country, and a DOE nationally approved WAP tool for ALL residential building types. All California users can try TREAT free for 30 days! To welcome all of our new users in California, Performance Systems Development is offering special pricing on purchases of TREAT and a seat in one of our online training courses through May 31st. This 6 hour course is taught over 2 days and is designed to teach users all they need to know about using TREAT for fast and accurate modeling! Users save over $100 with this special pricing. Pick from several training dates for your convenience by proceeding to check out. This training also provides 6 BPI CEUs. If you’re interested in purchasing TREAT software or training as a stand alone, contact Clifford Babson to order at cbabson@psdconsulting.com or 215-381-2929 x 313. 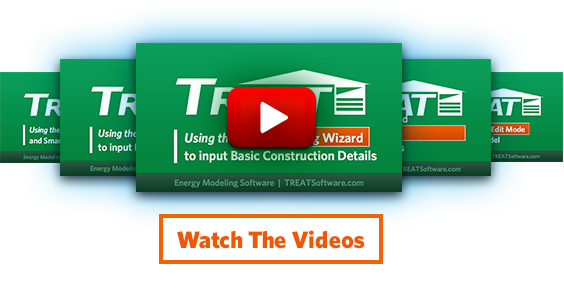 TREAT has a number of great features including attractive Customer Reports and our New Building Wizard. Read all about the latest features in TREAT here. You can watch our free introductory training videos here. Learn more about TREAT’s professional and programmatic certifications. Review the specific modeling guidelines for the Energy Upgrade California Home Upgrade Program. TREAT Licenses are priced to own and come with 1 free year of customer support and free upgrades. After the first year there is an annual fee of $200 associated with maintaining customer support and access to 100% FREE upgrades. Use this table to lookup the incoming cold water temperature of the location you selected in the Long-term Weather Sites in TREAT. This temperature is to be used in the Advanced Building Inputs in the TREAT Weather/Defaults Screen. This table can also be used as a reference to help define the beginning and end months of the heating and cooling seasons in TREAT. Streamlined modeling process using the New Building Wizard. Scenario Management: Build multiple improvement packages using the same base model for quick comparisons. Engaging Customer Reports! Show the value of your services to your potential customer and sell more jobs!